House by house, village by village, you are helping us bring an end to the global water and sanitation crisis. Last week, Lifewater recorded the twenty-thousandth “Healthy Home,” a milestone that marks more than 100,000 people actively practicing five life-changing hygiene and sanitation habits. Lifewater works exclusively in poor, rural regions like sub-Saharan Africa, where UNICEF reports that 1 child in 36 dies in the first month of life, most often due to preventable diseases. These diseases—malaria, diarrhea, and pneumonia—are caused most often by malnutrition, contaminated water, and poor sanitation and hygiene. 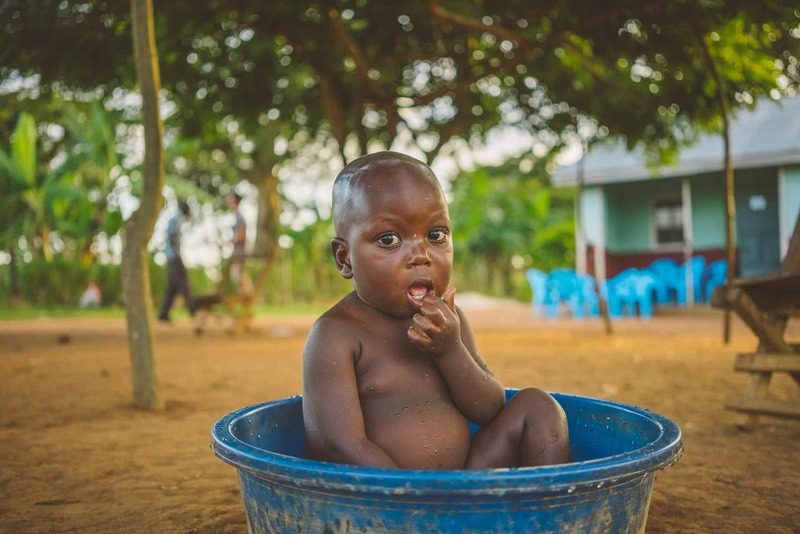 A baby has a bath in Kaliro, Uganda. In addition to access to safe water, adopting healthy sanitation and hygiene behaviors is the most practical way to reduce poverty and work towards eliminating child mortality. Lifewater’s vision is safe water for every child, a Healthy Home for each family, and the love of Christ for all it serves. The five “healthy habits” of a Healthy Home are central to Lifewater’s WASH (water access, sanitation, and hygiene) curriculum, and they are taught in individual homes across Uganda, Cambodia, and Ethiopia. 1. Handwashing. Washing hands with soap stops the spread of disease. Every household builds simple handwashing devices with local materials. 2. Drying Rack. Washing dishes and drying them in the sun, away from animals, helps stop the spread of harmful pathogens. 3. Clean Compound. Keeping the household environment clear of trash and feces discourages germs, keeps people safer, and helps them take more pride in their home. 4. Safe Water Storage. Clean water stored in dirty containers becomes contaminated water. Families learn to keep water safe from collection to consumption. 5. Latrines. Building and using a simple pit or pour-flush latrine separates people from poop, drastically decreasing water-related diseases. It also provides safety and dignity. In Lifewater’s program area of Bensa, Ethiopia, Healthy Homes are surging, with village members eager to improve their lives. Parents want their children to grow, attend school, and play without the hardships of illness. Families in Healthy Homes have changed the trajectory of their lives forever. “Growing up in a Healthy Home means vulnerable children will not only survive their childhood, but be put in a position to thrive physically and mentally,” Lange said. Lifewater is actively working in over 31,166 homes across the developing world. See real-time updates here.